The EchoStar IX satellite is equipped with one of the first commercial Ka-band spot-beam payloads for use over the United States and will be critical to the development of future generations of Ka-band services. EchoStar's Ka-band portion of the satellite will be used to test, verify and deliver future broadband initiatives for the company. The satellite payload also includes 32 Ku-Band fixed satellite services (FSS) transponders, at approximately 120 Watts, that will enhance EchoStar's current U.S. DISH Network satellite TV service, including additional service for Alaska and Hawaii. The satellite will operate at the 121 degree West Longitude orbital location. With the successful launch of EchoStar IX, constructed by Space Systems/Loral based in Palo Alto, Calif., EchoStar continues to invest in new satellite technologies to expand services for its 8.18 million customers nationwide. EchoStar IX will join EchoStar's current fleet of eight satellites that provide DISH Network customers with hundreds of all-digital television channels, including interactive TV services, sports programming, high definition television and international programming. An additional C-band payload on the EchoStar IX satellite will be owned and operated by Loral Skynet, a wholly owned subsidiary of Loral Space and Communications, as Telstar 13. Loral anounced in July 2003 a definite agreement to sell Telstar 13 to Intelsat, which operates the C-band payload as Intelsat Americas 13 (IA-13). 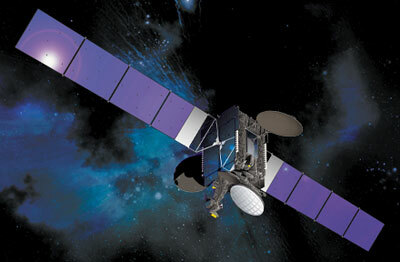 Intelsat changed the name of the Intelsat America 13 satellite to Galaxy 23 effective to 1 February 2007. The satellite was launched from a floating platform at the equator aboard a Sea Launch Zenit-3SL (2) rocket.